← Scottish Fold, Blue British SH, Toy Dog and Chartreux Mixed! This cat breed is another instance of a natural genetic mutation affecting a part of the cat’s body that has been seen by people as different and attractive. The dominant genetic mutation affects the cartilage of the ear flaps (pinnae) causing the ears to fold down against the head. Cat of this breed were (still are?) called lop-eared cats. With the folded ears and large eyes this cat has the appearance of an owl. In terms of body shape it is considered to be in between the British and American Shorthair cats1. All Scottish Folds are born with straight ears and not all kittens in a litter will have folded ears. At about 13 to 23 days old the ears start to fold1 (the CFA say 21 days). The ear flap is called the pinna. Selective breeding has created several folds whereas the initial mutation produced one4. The greatest obstacle to making a success out of this breed of cat is the health issues associated with the genetic mutation that produces the folded ears. Some breeders say that Fold can be breed to Fold while others disagree1. The origin of this breed is similar to that of the American Curl and indeed follows the route of other individual cats that have become breeds due to a mutated gene. In 1961, Susie, a white cat with a “fold” in her ears (due to the ear cartilage being affected by the mutated gene), was a barn cat living near Coupar Angus, Scotland (UK). She was born on the McRae farm. Apparently this cat breed is called the Coupari by some Canadian breeders; I see why. It is said that the long haired Scottish Fold are also called Coupari cats2. The American Wirehair breed commenced under similar circumstances. The neighbor of the owner of the barn, a shepherd named William Ross noticed Susie and became interested in Susie’s litter, which contained 2 kittens with folded ears. McRae has promised that he would notify Ross when the kittens were born. One of the kittens with folded ears was a white female who was named, “Snooks” and she was given to Mr Ross and his wife Mary. She was bred by Mr & Mrs Ross to a domestic tabby cat. The other offspring was a white male with folded ears who as aptly named, “Snowball”. The Rosses later acquired a white British Shorthair cat by the name of “Lady May” and thus began the Scottish Fold cat breed1. Susie was killed by a car three months after the birth of Snooks2. The breeding indicated that the gene causing the folded ears was dominant (it’s action can be described as “dominant with incomplete penetrance”, meaning I presume, in layman’s terms, that the effect of the gene is not always present). The book “Medical, Genetic & Behavioral Aspects of Purebred Cats” (edited by Dr Clark) says that the gene is autosomal dominant. A dominant gene results in at least half the litter having the mutated gene’s characteristic. The gene is labeled as “Fd”. As there are different degrees of ear fold there may be other genes involved that modify the action of the Fd gene. The initial breeding program produced 76 kittens in the first three years—42 with folded ears and 34 with straight ears3 indicating the presence of the dominant mutated gene. The Scottish gentleman (local shepherd William Ross) cat fancier and cat breeder who started the breed (with the help of geneticist Pat Turner3) tried to register the breed with the Governing Council of the Cat Fancy (GCCF – the UK cat fancy registry). They agreed in 1966 but withdrew registration in 19712 and that is still the case (neither does Europe as a whole register this breed). This is for health reasons. Ears that are folded over offer the potential for ear infection and mites, potential deafness plus there are the associated health issues mentioned below. Some gene mutations confine their influence on the formation of the cat’s body to a particular area (e.g the folded ear). However, this mutated gene is not only associated with the folded ears but a thickening tail and swollen (thickened) feet. The thickened tail results in less flexibility. Please note this though (and don’t be put off or think that I am being too negative about this breed):- Good breeders will do all they can to minimize this and breeding Fold to non-Fold rarely produces a cat with the accompanying tail and feet deficiencies (but see below). See more on health issues below. If the cat has both the mutated genes (homozygous form – genes come in pairs) then the kitten will die in the womb. There is a similarity here with the dwarf cat as the dwarf gene also has a potential for causing “secondary” defects (in the dwarf cat this can be, for example, a “tight chest”). You can read more about dwarf cats on this website. The dwarf gene also affects cartilage growth. However, Dr Clark says that fold to fold mating results in 1 in 3 Scottish Fold kittens that develop mild to severe skeletal lesions. These are prognathia, vertebral deformities and severe joint disease. The deformed vertebrae affects the coccygeal vertebrae causing a shortened tail. The tail becomes very inflexible. The bones in the rear legs may be shortened causing curved hocks. Accordingly, this breed has to be developed by breeding heterozygotes to American and British Shorthair cats. 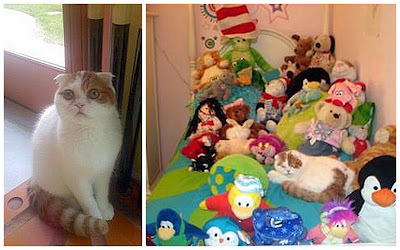 The results in many purebred Scottish Fold cats with normal ears. Dr Clark’s book also mentions that red blood cell destruction happens more commonly in the Scottish Fold newborn kittens than in other breeds. This condition is called Neonatal erythrolysis. The disease is a major cause of fading kitten syndrome. There may be a problem with treating ear mites due to the folded ears. In a talk given by Richard Malik, BVSc, DipVetAn, MVetClinStud, PhD, FACVSc, MASM at the 28th Congress of the World Small Animal Veterinary Association on genetic disorders of cats, he referred to the condition Osteochondrodysplasia in this cat. Even when cats of this breed are mated with normal eared cats resulting in heterozygous cats a progressive arthritic condition takes hold. He says that this is to be expected as the folded ears are due to cartilage that is insufficiently resilient to maintain the shape of the ear flap (pinna). As a result it is not surprising that articular cartilage (cartilage where bone meets bone) is not fit for purpose. This breed was exported to the USA (1971) and breeding continued by crossing with British and American Shorthair cats2. As might be expected the defining feature of the Scottish Fold, the ears, has been “enhanced” through selective breeding so that the ear now folds more smoothly (i.e. the fold is in three places as opposed to a single place). The breeding program has resulted in this breed having long and short hair of various colors and patterns except Siamese and Himalayan style pointing (this may be for health reasons). However, the Cat Fanciers Association allow the pointed pattern. Update 6th Dec. 2008: Scottish Fold Kittens [link ] is a post reflecting on the dilemma of whether we should adopt a cat of this breed. I have not distinguished thus far between long haired and short haired Scottish Folds. The cat heading this page is a long haired cat, for example. The two types, long and short haired, differ only in respect of hair length. In the UK, specifically England, the British Shorthair cat had frequently been used as an outcross for the Fold. And the Persian had been an outcross for the Brit SH, so it is no surprise some long hair crept into the Scottish Fold. The long haired Fold achieved TICA championship status in 1987. When breeding long haired Folds two genes are involved. The dominant gene causing the folded ears and the long haired gene, which is recessive to the gene for short hair. To enhance the prospect of achieving a long haired cat, two Scottish Folds need to be bred (e.g. two long haired cats of this breed). That is bad practice vis-à-vis the defective, mutated gene that causes the folded ears, as there is a risk that the kittens could develop into crippled cats due to cartilage defects in the leg joins. Perhaps the Scottish Fold long haired cat is more easy going than the short haired cat. They are undemanding and gentle. Longhaired Scottish Folds are called Scottish Fold Longhair, Highland Fold, Longhair Fold and Coupari depending on the cat association2. See Breed Standard in précised form and illustrated. They are quiet cats with small voices and a nice yet hardy1 character. They like companionship and attention. The combination makes them suitable for apartment of full-time indoor living if that is acceptable to the person generally. The ears are small and tightly folded. The Scottish Fold is not cobby or massive but of medium size. In cat fancy parlance the body shape is semi-cobby. The Scottish Fold has a short nose and a round, broad head. The coat is dense, plush and medium short. The coat stands out from the body. The eyes, which should conform to coat color1 are round and large and there is a slight “stop” between the forehead and the nose. The length of the muzzle although short but not as short as that of the Persian (non existent almost) and longer than the muzzle of the British Shorthair1. In the show hall cats with tails that lack flexibility, kinked or short are disqualified. All colors of all divisions of the pointed and traditional categories are accepted by the associations1. Important: As a result of the potential for secondary problems caused by the mutation, when adopting a Scottish Fold it is sensible to gently check tail flexibility and thickness. The cat should have no lack of mobility due to short coarse legs or splayed toes. The hardening of the cartilage of the tail (and sometimes the ears) can develop later. When adopting it would be wise to discuss this. Helmi made a good point about this. Once you have adopted a Scottish Fold you will bond with him/her and you will not want to return your cat. Clarify this issue at the beginning for you and your new companion. Scottish Fold Cat src: unknown but in general circulation – this picture is digitally manipulated. When a cat is being defensive she flattens her ears completely to protect her ears from claws during a fight. This cat breed displays the defensive ear position all the time giving her a continuously defensive appearance. This may have an effect on how she is perceived by other cats that may live with her. When I moved to my present home, on the very first day I noticed a large cat with funny ears sitting in the front garden. This is my kitty Symphony. She was the best cat I ever had with the cutiest routine every night that we called “the symphony shuffle”. Click on this link to see the Wikipedia® License src: Wikipedia® published under GNU Free Documentation License, Version 1.2 or any later version, November 2002 Copyright (C) 2000,2001,2002 Free Software Foundation, Inc. 51 Franklin St, Fifth Floor, Boston, MA 02110-1301 USA – – no other conditions to the license are added. The map is a modified (cropped) version Derived from Wikimedia Commons image of original work forming part of the “Europe location” map series created by David Liuzzo: derived from Image:Europe_location_SCO.png. This entry was posted in Scottish Fold and tagged genetic mutation cat, Scottish Fold, Scottish Fold cat by Michael Broad. Bookmark the permalink. Harley is just over a year old and has started to limp on his front right leg and sometimes his front left leg. His father is a Seal Point Snowshoe Scottish Fold and his mother is a Calico Oriental Shorthair. I am wondering if Harley could have a mild form of arthritis due to the breed. I did contact the breeder and she told me that she didn’t think this was a problem with her cats. Although she did say one of the kittens from the same litter had a limp but the owner did not get back to her so she thinks it just had a fall and it was fine. Do you think there could be a possibility that Harley could have this problem? His legs do not look swollen, and when I manipulate them he doesn’t pull away, but I have noticed that the slight limp is now more noticeable. He also is not his loving self and spends most of the day sleeping. When he does come down from his cat tree it is very gingerly. I do have an appointment at the vets this weekend but didn’t know if I should mention this as I am not sure if he could possibly have Osteochondrodysplasia. I would appreciate any advice you could give me. I have a Scottish Fold (Harley) he is just over a year and has started to limp on his front right leg, sometimes he limps on the left front leg also. The father was a Seal Point Snowshoe Scottish Fold and the mother was a Oriental Shorthair. Could there be a genetic abnormality like Osteochondrodysplasia that is causing this? Janet, I’ll do some research asap and write a second comment to answer your question. Thanks for visiting and commenting. It sounds like a skeletal/cartilage inherited problem. Scottish Folds suffer from “Incapacitating joint disease with Scottish Fold to Scottish Fold breeding”. This link takes you to an article on genetic diseases in purebred cats. Thank you for your reply Harley’s parents the father is a Seal Point Snowshoe Scottish fold and the mother is a Oriental Short Hair. So I didn’t know if he could even have Osteochondrodysplasia. My research tells me that “Periarticular exostosis (A benign cartilage-capped protuberance from the surface of long bones but also seen on flat bones) and ankylosis (abnormal stiffening and immobility of a joint due to fusion of the bones) may develop in the limbs”. So even with two different breed of cats given that he does have the folded ears he still could possibly have this problem? I am not sure but…it seems possible based on my research. I take him to the vet today. I will let you know what they say. Thank you so much for you information and taking time to reply to me. Took Harley into the vet today at 8am. After talking to the vet and showing a video of Harley limping on both front legs and sharing with her the health problems some Scottish Folds develop I left him at the facility as they said it might take time. Around 4 pm. called they said they had a few problems with their x-ray machine they had to wait for the radiologist to read the film and make a report. No signs of Osteochondrodysplasia. He suspects a soft tissue injury. Okay so his limping has gotten worse on the left front leg. If he had a soft tissue injury wouldn’t it show signs of getting better not worse? Also, the limping is now in the right front leg. (another soft tissue injury). I do not agree with his opinion. Harley is strictly an inside cat sleeps nearly all day and night. Personality has changed from constantly wanted to be loved to being very withdrawn. They suggested maybe a specialist, may a infectious disease specialist. The report ended up by saying Bilateral enthesophytosis of the calcaneus with mild tarsal osteoarthrosis, although give they young age, some level of developmental malformation could be present. So after $500 dollars I am left confused, worried and feel helpless on how to help my Harley. I just wanted to let you know the outcome. Many thanks Janet. That was not a good vet visit. And they don’t seem to have a handle on what is going on. I agree that it is almost certainly not a soft tissue injury. In other words the gene causing the folded ears can also affect the feet and tail. Are his paws swollen and stiff? Is his tail the same? Is there anything abnormal, even slightly abnormal, about his fore paws and his tail? Even when cats of this breed are mated with normal eared cats resulting in heterozygous cats a progressive arthritic condition takes hold. It would seem to me that Harley is arthritic in his front legs and his paws may be stiffened. All-in-all I’d say he is suffering from the side effects of having flat ears. There does not seem to be anything abnormal about his tail or fore paws at all. All I know is that he is totally a different cat. He isolates himself most of the day and doesn’t want to held. Which is 180 degree turn around behavior wise. They wanted to put Harley on an Opioid and then told me it would make him a little crazy. I didn’t want that if he is limping now what could that do for him if it would make him race around. As I say, he sleeps most of the time and acts like he is a much older cat, not a cat that is a little over a year. I did contact a vet out of our area and without seeing Harley she did say that it could be in his joints but may not even show up on a xray. She recommended Dasequin a glucosamine product. The vet that I did take Harley to did not think that would help and dismissed that idea. I will investigate that more myself. I don’t want him to be in pain and would love to have my old Harley back but I don’t think that will ever happen. No matter what this vet has said to me Michael, I believe in my heart and soul that Harley has some kind of joint problem. Again your input has meant so much to me. I will just give Harley all the love and attention he wants and monitor him very closely. His change in behavior is probably be due to discomfort and that is possibly his legs. What you might do it get a vet’s advice on administering some painkillers for a short time. If his mood picks up you’ll know he is in discomfort causing him to be miserable and I’d say it is arthritis of some sort due to his genetic inheritance. There may even be more going on beyond his joints. The books don’t indicate any inherited diseases for this breed other than skeletal problems as mentioned. Good luck. I think so too. I will get some pain killers just to see how he reacts. I appreciate your knowledge and time. I didn’t realize you were in England. I was born and raised there until I came to Paradise California 40 years ago. I just retired from the school district after 40 years and that is why I got Harley. Take Care. Thanks for replying and I look forward to finding out what is wrong. I suppose the question is whether it is a genetic illness (i.e. linked to being a Scottish Fold) or not. Harley has not shown any improvement so the vet gave him pain medication. Still after 6 days no signs of improvement. Today I went back to the vet and they decided to do blood work on Harley. The technician came back and said I had to return in two weeks for another urinalysis. I was puzzled by that, but said okay. Then she gave me Cephalexin 250mg. I asked her why, and she said for his infection. WHAT!! So as he is on another medication I said I didn’t know she was putting him an additional medication. So, I though okay maybe they did a urinalysis and found that he had an infection. I did ask her to go back and double check and make sure he is supposed to take this with the pain medication plus, I was really feeling confused about not knowing why the vet herself had not told me they had found something. I guess the vet told her it would be just fine for the two medication to be given to Harley. Well, I was just about to give him a pill and the phone rang. It was the vet telling me they had given me another animals medication by mistake. (OMG). Needless to say the appointment they made for me for a urinalyses was cancelled. Harley has enough problems without adding another animals problems to his. Thank God I didn’t give him the medication.